The ferret is a mammal in the weasel family, which includes weasels, mink, badgers, skunks and otters. Ferrets love to steal and hide things, hence the origins of their name. Why do ferrets love to steal and hide things? It’s believed it’s related to being descendants of the European polecat. The polecat would hide prey from other animals. It’s believed ferrets retained this behaviour from their ancestors. Ferrets have long and slender bodies, long tails, short legs and long claws. Ferrets have a cone-shaped head with small ears and whiskers. Their head and body shape helps ferrets squeeze through small spaces, which makes them great escape artists. Sexual dimorphism (the physical differences between genders) is obvious in ferrets with males being larger than females. Female ferrets weigh an average of .75–1.5 kgs (1.5–3 pounds) and are around 51 cms (18 inches) in length, nose to tail. Male ferrets are larger than females. They can weigh 1.5-2.5 kgs (3-5 lbs) They can grow to 60 cms (24 inches) in length. Domestic ferrets have different colour patterns in their coats because of selective breeding. The most popular is the sable (fitch) ferret. Sable ferrets have beige coats w/ black feet, tails & black facial markings. Other ferret types include albino, cinnamon, champagne and panda. Because they can’t sweat and they don’t pant like a dog (or a cat), ferrets can suffer from heatstroke if it’s too hot. For ferrets in captivity, their environmental temperature should be kept below 32 degrees C (90 degrees F). Ferrets are true carnivores and only eat meat. Their bodies can’t handle a diet that contains more than 4% fibre. Ferrets love to chew and it’s dangerous for them if they chew on or ingest the wrong things (electrical cords, foam, etc.). Ferrets are crepuscular animals, which means they are most active at dawn and dusk. Ferrets sleep a lot every day. They will sleep between 14- and 18-hours a day. 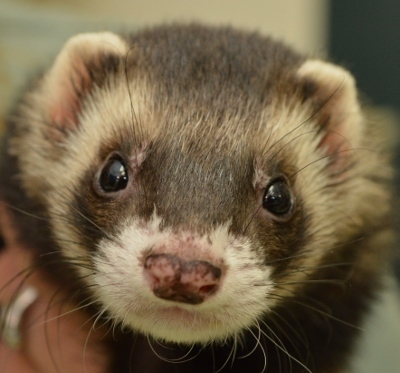 This is the second time we have featured ferrets as our Animal of the Month. Check out our blog post from September 2014 to see our tweets about ferrets the first time they were in the spotlight!